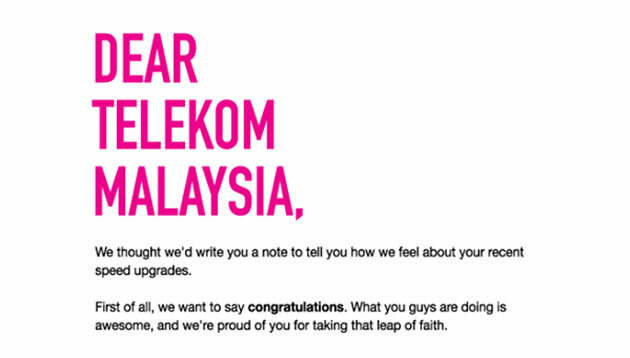 Telecommunications provider TIME dotCom has put out an open letter congratulating Telekom Malaysia (TM) for making the recent effort to upgrade its high-speed broadband service. The cheeky yet bold Facebook post, which garnered over 7.3k reactions, 1k comments and 4k shares at the time of writing, described what TM’s initiative as “awesome” and said that TIME is “proud” of them for taking the leap of faith. TIME added that it is great that it now has a “frenemy on the same wavelength” to provide Malaysians with accessible high speed broadband. Netizens’ reactions saw many urging the telco to improve their coverage before poking fun at a competitor. Others also urged TIME to expand its coverage area. Meanwhile, some consumers showed support for TIME by telling it to keep up the good work. A+M has reached out to TIME for comment. Last month, it appointed Dentsu One Malaysia as the lead agency to provide integrated marketing solutions. The agency is tasked with developing TIME’s ad campaigns for both traditional and digital media. It also oversees TIME’s digital media strategies and planning through a collaboration with Vizeum Malaysia. Merchants can now tap on Lazada's branding services to create online store fronts and have dedicated campaigns. .. Yes it’s possible - real time marketing can be a muscle memory for brands, says Twitter’s regional lead Parminder Singh. ..